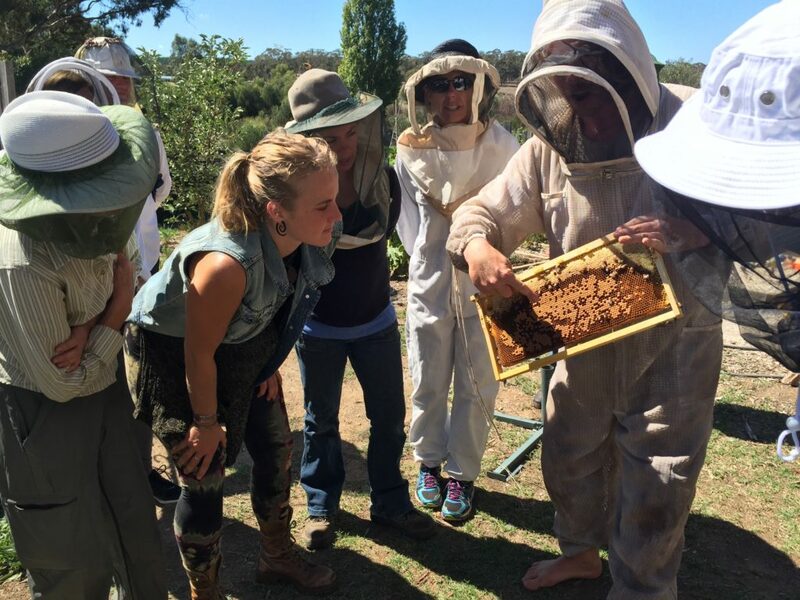 Castlemaine Bee Sanctuary runs Introduction To Bee-Centred Beekeeping classes where we show you everything you need to begin your journey with these fascinating creatures and become a registered beekeeper yourself. 2 Day Introduction To Bee-Centred Beekeeping class at Daylesford Neighbourhood Centre on the weekend of Saturday 11th and Sunday 12th May from 10am to 4pm. The cost for this 12 hour class is $300/$200 concession/Adopt-a-Hive hosts/Hive Tour attendees. Please call the centre on 03 5348 3569 for bookings. What is Bee-Centred Beekeeping and how is it different from conventional/commercial beekeeping? Click here to find out. Using a combination of different delivery methods you will learn everything you need to begin your journey with these fascinating creatures and become a registered beekeeper yourself. We will discuss exactly what Bee-Centred Beekeping is and how it differs from the conventional/commercial style. We will show you how to catch and hive a swarm of bees (free bees!) and how to look after them throughout the year. We will talk about the importance of natural comb and how to harvest pure natural raw honey from your own garden without the need for expensive equipment. You will have an opportunity to look, in real life, at the different styles of hives used in bee-centred beekeeping (Natural-Cell Langstroth, Warre, Kenyan and Long Langstroth) so you can easily decide which suits you best and there will be opportunities to look inside working hives and handle the bees. We usually process honey (if available) from the comb and you get to take a jar (and/or some comb honey) home with you, as well as sampling a wide selection of other hyper-local honeys from Castlemaine Bee Sanctuary’s and other local beekeeper’s hives. We may even have a taste of some home-made meads (honey wine). We always have at least one guest speaker talk to us about their experience with bees and beekeeping using video conference technology. We are deeply honoured to announce that we’ve managed to book the eminent Professor Thomas Dyer Seeley, Professor in Biology in the Department of Neurobiology and Behavior at Cornell University, author of Honeybee Democracy and The Wisdom of the Hive as the guest speaker over Skype. Find out more about Tom by clicking here. After the course, ongoing support will also be available directly from Daniel BeeShepherd and you will be invited to join an online community of like-minded beekeepers who are extremely supportive and helpful. Introduction – What Is Your Goal? What is Bee-Centred Beekeeping ? Different Styles Of Beehives Pros and Cons & What Makes A Beehive Bee-Centric? To book please call Daylesford Neighbourhood Centre on (03) 5348 3569. There are also other ways to become a bee-friendly beekeeper. Click here for more information. “I did just want to say a big thank you for sharing your boundless enthusiasm and knowledge on all things bees with us. “I’ve been a beekeeper for a few years now but when I did Daniel’s beekeeping course it opened up a completely new world to me. Daniel’s unconventional approach has been a blessing. I learnt so much about caring for bees. Daniel’s follow-up mentoring has taken away the stress I used to feel when having to do a hive inspection. His knowledge and complete calmness has had a flow on effect. I couldn’t recommend his involvement highly enough”.